This digital document is an article from Community College Week, published by Cox, Matthews & Associates on November 27, 2000. The length of the article is 3074 words. The page length shown above is based on a typical 300-word page. The article is delivered in HTML format and is available in your Amazon.com Digital Locker immediately after purchase. You can view it with any web browser. Among higher education institutions in the United States, for-profit colleges and universities have steadily captured a larger share of the student market. A recent trend at for-profit institutions is the coupling of job training with accredited academic programs that offer traditional baccalaureate, professional, and graduate degrees. Richard Ruch, with administrative experience in both the nonprofit and for-profit sectors of higher education, takes us inside these new for-profit institutions, describing who teaches there, who enrolls and why, and how the for-profits are managed and by whom. He analyzes their different structures, services, and outlook on higher learning and training, and explains in detail how they make profits from tuition income. 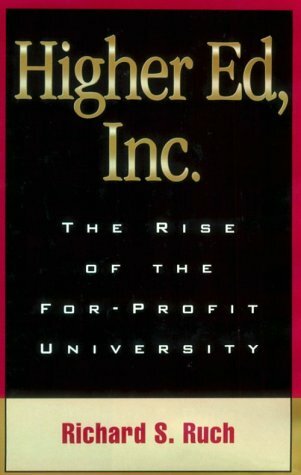 Higher Ed, Inc.: The Rise of the For-Profit University is well written, Ruch has worked in both profit and non-profit universities. This is a good source on the topic. The Ruch book was a resource for an MBA presentationpaper about for-profit universities. I also found Gary Berg's,Lessons from the Edge: For-Profit and Nontraditional Higher Education in America (ACE/Praeger Series on Higher Education) useful. Other's in this category are Declining by Degrees (about the decline of quality in non-profits)by Merrow and Hersch and Rebel with a cause: The entrepreneur who created the University of Phoenix and the for-profit revolution in higher education by John Sperling. Fascinating reading--as with most things the message in the popular press does not tell the whole story. Be sure to read both sides of the story, Merrow (also a PBS DocumentaryDeclining by Degrees: Higher Education at Risk) does a good job (perhaps unintentionally) of showing how money is the driving force in the non-profit state schools too. The documentary interviews students, professors, and leadership at two state run institutions. And it's name is "Money." Higher Ed, Inc., breaks down the innovation of "For Profit" education and takes you inside its corridors.An excellent book for those looking to enter "For Profit" education as a business person. Higher Ed, Inc. actually influenced me to re-think my business plan. My institute will become a bigger "For Profit" within supplementary education, because of this book. Core Edge Image & Charisma Institute, Inc.
Definitely about For-Profit.I was hoping for more comparisons between Non-Profit and For-Profit. As mentioned in the other reviews, Ruch provides a balanced comparison between the traditional (tax-exempt) university and the non-traditional (for-profit) university.The book was very readable and showed the outcome is similar, but the perspective and approach is different. The most enlightening is that the "for-profit" university is not a new idea, as Ruch traces early examples back into the early days of America and in Europe. Also enlightening is the new trend of traditional universities using extension services to bring in money to the university as a for-profit branch of the school. I did notice at least one error in the information.When discussing the faculty salary at one of the for-profits, I found that we overstated it by about $400-500.As a faculty member of over six years for the school, I can vouch that we have never made that much, not even with a doctorate degree. Overall, I would recommend reading this just to see that the schools are not as different as they think they are.